Jess Lee Beaver was last seen Saturday, April 6, 2019. He currently wears a mustache. Courtesy photo. Editor’s note: Police said Monday that Beaver was found safe by sheriff’s deputies in Blythe. 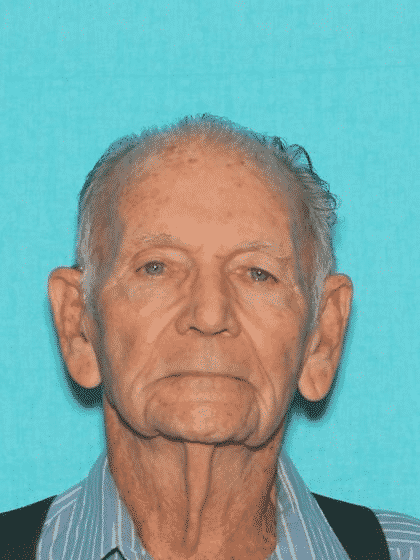 Police are asking for the public’s help in finding an 87-year-old man who was last seen noon Saturday in Texas before he boarded a plane bound for Long Beach as part of a trip to visit family about two hours northeast of the city in Apple Valley. Police said Jess Lee Beaver landed at Long Beach Airport Saturday and spent the night at a local hotel before he returned to the airport the next morning to rent a red 2019 Dodge Challenger, with a license plate of 8FNE576. Beaver planned to visit family at Apple Valley but has not contacted relatives or arrived at the location, according to a release from the Long Beach Police Department. He is described as a white man with gray hair and blue eyes weighing 170 pounds and standing 5 feet, 10 inches. He was wearing a khaki jacket and pants, eye glasses and a baseball hat. He wears hearing aids in both ears and has full dentures. He suffers from medical conditions and may become disoriented, authorities said. Anyone with information regarding this missing person is urged to call the LBPD Missing Persons Detail at 562-570-7246 or Police Dispatch at 562-435-6711.